It is possible to whitelist specific sites, which allows the ability to access those specific sites and run Java applets and Java Web Start applications that do not meet the latest security requirements. 3. 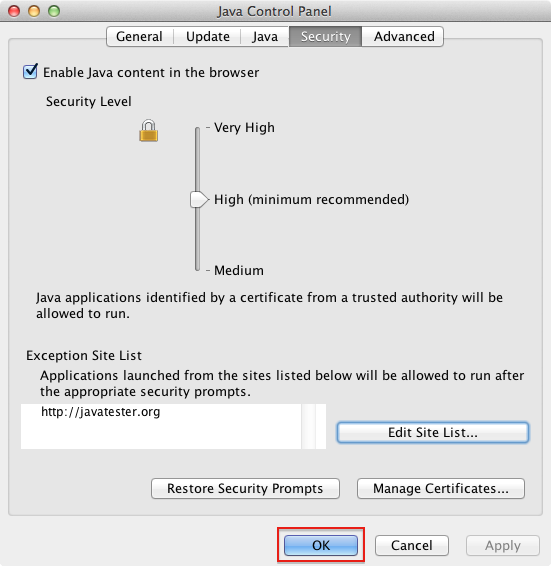 In the Java Control Panel window, select the Security tab. 5. 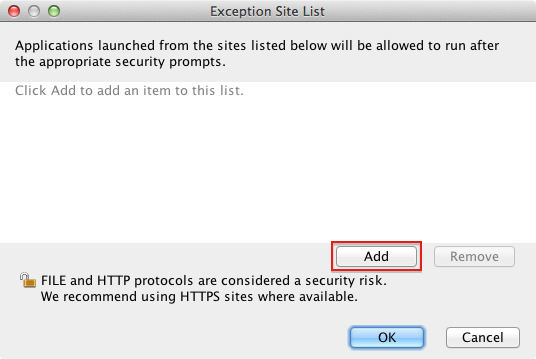 In the Exception Site List window, click the Add button. 6. Enter the site(s) you want to whitelist. 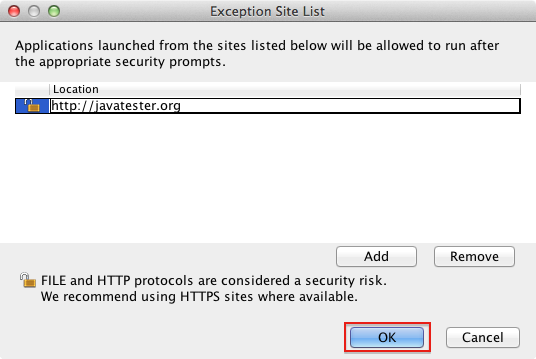 Note: If you are adding sites starting with HTTP, you will have to confirm that you want to add the site. 7. When finished, click the OK button. 8. Click the Apply button if needed. 9. 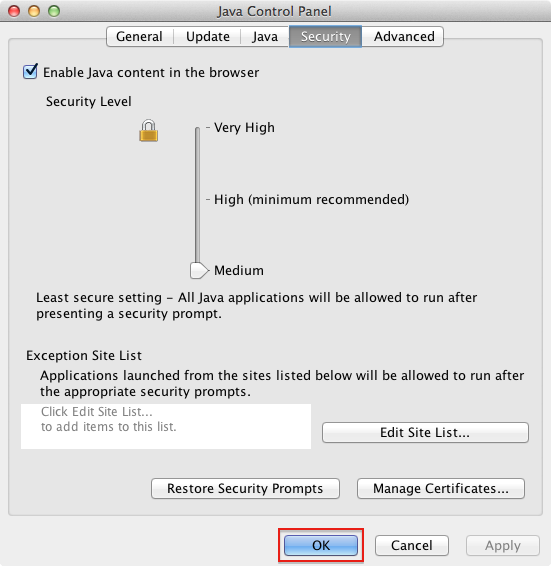 Click the OK button to close the Java Control Panel window. It is also possible to lower the security level to Medium, which is the least secure setting. At this security level, all Java applications are allowed to run after presenting a security prompt. 4. Move the Security Level slider from High to Medium. 6. 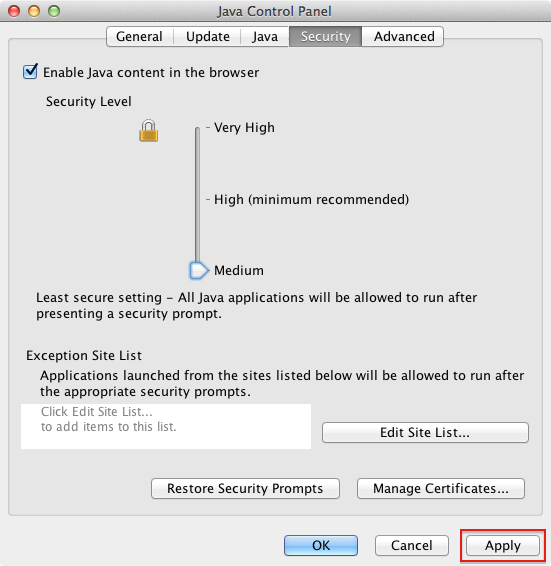 Click the OK button to close the Java Control Panel window. 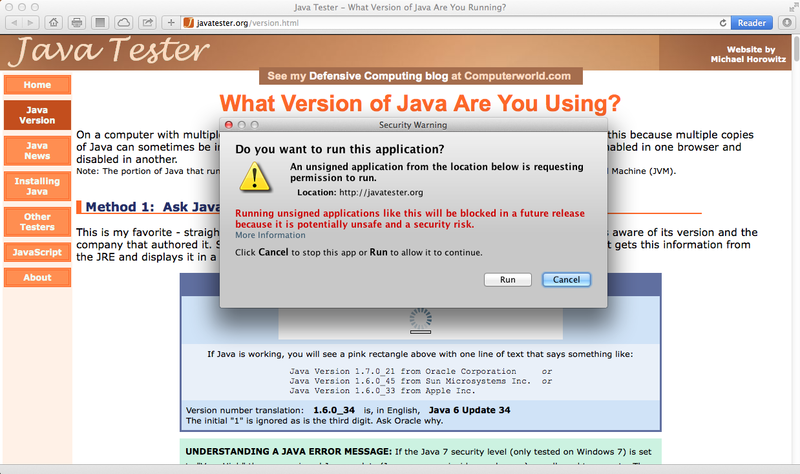 If all goes well, you should now be able to run the needed Java applet. For those looking to automate this the exception.sites file is located at ~/Library/Application Support/Oracle/Java/Deployment/security. 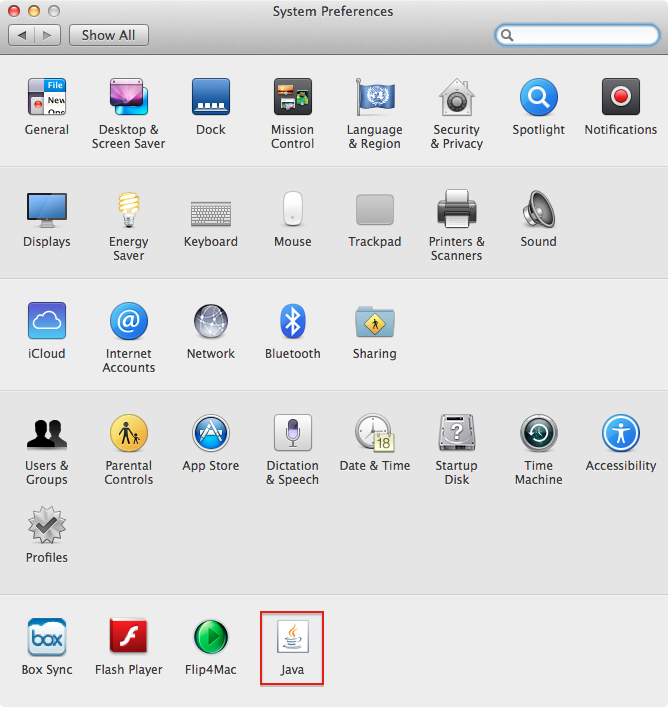 You can append all of your Juniper VPN sites to the file. It does not impact the previous version of Java if you create the file and push it to that location. I do not see the folder you stated, only see ~/Library/Application Support/Oracle/Java/ and 2 files within this director. Thank you very much!! This was driving me nuts. Happy to find somebody explaining this the day after the update is released! I am working with windows here. When I go to the security label, my only button is manage certifications and there is no “edit site list” … any suggestions as to what my next move should be? Thanks for posting your reply. I installed the 64-bit version and now the Java Control Panel contains the Edit Site List button. I have updated my Java to Java 7 51. and now I have much more problems because I cannot connect anything. I couldn’t try your script. for Windows 7, go to advanced tab and turn on Java Console. Then you should see this in your start menu. 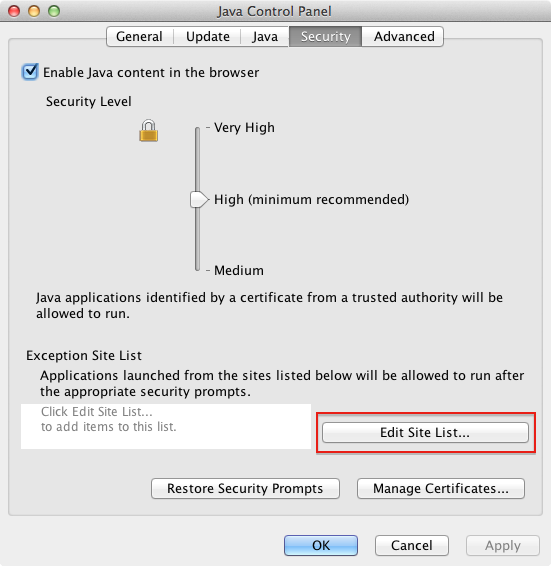 The Java Console has the Site List options. oh god, nothing helps! I’ve tried everything. 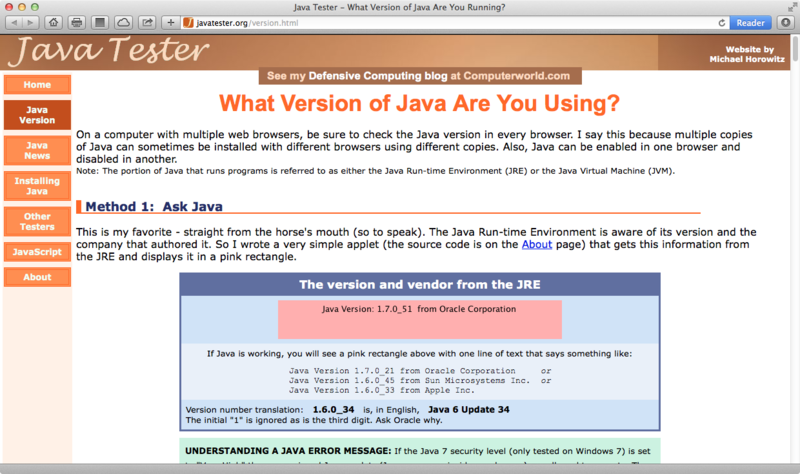 since the java 7 update 51 nothing works on my mac. i simply can’t open the applets of java chatrooms or games. several sites are affected. from the start, i moved the security level down to medium, i add all the domains to the exception site list. and after I did that, I was able to enter the chat rooms once. Thank you, that has worked for me – just switch on and off “enable java content” and white list started to work. Thank you! It worked but I am facing another issue now. 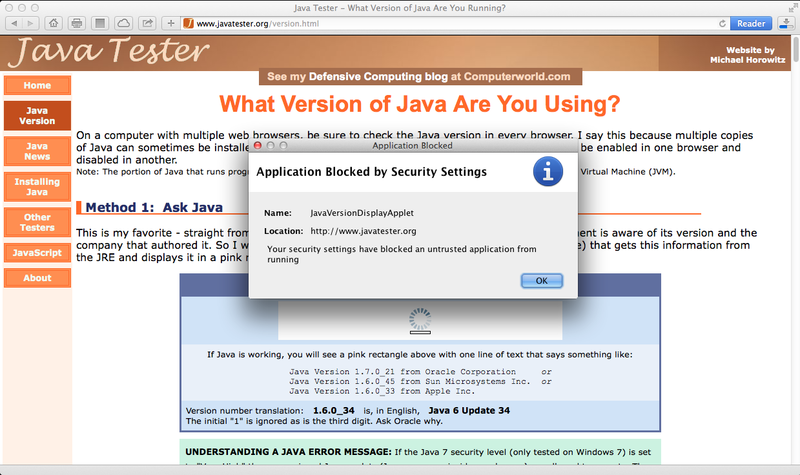 I have Java 7 Update 51 and recently updated Safari to 6.1.1, After i updated Safari, when i connect to vpn, internet is blocked. When i sign out in Network Connect, internet works. Without internet, my purpose of connecting to vpn becomes a waste. Any help is very much appreciated. Awesome – thank you sooooo much! Worked like a charm on Windows 7. Thanks! i have been a player of Yahoo Spades for over 20 years. I have an older iMac, OS : 10.5.8 Lately, i get all the way into the game rooms/lounges, and join a table. Then it kicks me out and whole internet goes out. Of course internet comes back immediately, but same thing happens every time i go to Yahoo Spades site. What am i going to do? Also, i have a new Windows 8 pc that wont let me play this game either! Thank you so very much for posting this information!!! Is there a way to inject those settings via a postflight script so that when I install the pkg from oracle, I can have my exceptions added and the security settings set to medium? I wanted to add that I did a script for Windows where it searches for previous versions of Java, uninstalls them and then proceeds to install the newest version and configures it for no updates and other switches, in case anyone wants it… but I need to find a way to do the same for my mac clients. What if the applet I’m trying to run is from a downloaded JNLP file, rather than a website? Is there are way to have that automatically be cleared by Security without having to lower it to medium? For Windows7: First went to Control Panel & clicked on Java. On the Advanced menu clicked on Show Console. Apply. Backed out. Then went to the Start menu & clicked on “Show All Programs”. A menu opened with a folder for Java. Clicked on the folder and a list of options was shown. Clicked on “Configure Java”. Clicked on that & the Console opened. Clicked on Security tab. There it was…the Edit Site List. mechtild — Thank you !! Your detailed instructions were “exactly” what I needed. thank you so much… solved. Thank you. I couldn’t open eTime from ADP in Chrome (after a Java update?). My Java version is 1.7.0.67 (on Windows 7). 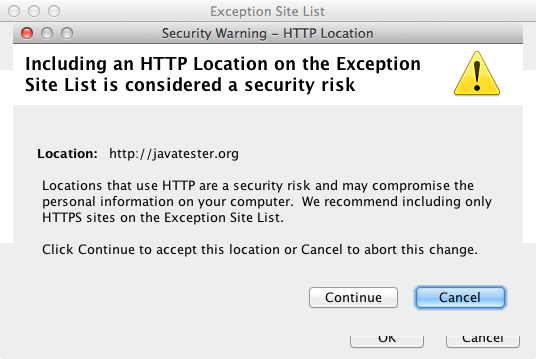 in Java Configure, Security, I put in a site exception for https://eetd2.adp.com . eTime now comes up though the UI looks somewhat different. Haven’t tried to use it yet. I figured out a way to get to the site list. I have the 64 bit and the 32 bit. Used Chrome. Windows 8.1. Can someone help??? Yay this worked! Thank you!! 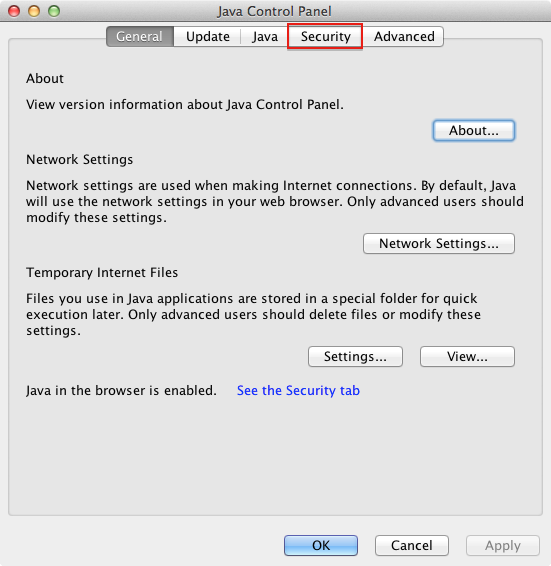 Question: If a newer version of java is installed will the security exceptions stay or will they need to be reentered?